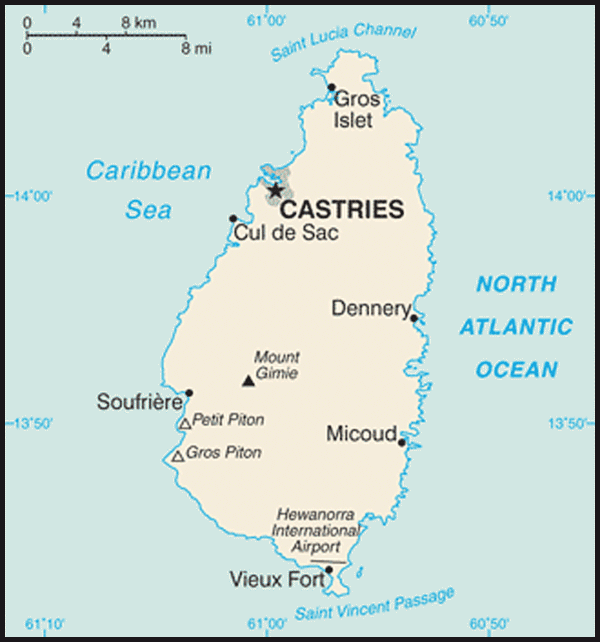 Cities: Capital: Castries (pop. est. 67,000); Micoud; Gros-Islet; Vieux Fort; Soufriere. Nationality: Noun and adjective: St. Lucian(s). Education (2004): Adult literacy: 94.8%. Health (2006): Infant mortality rate: 12/1,000. Life expectancy — men 73 years; women 76 years. Branches: Executive: governor general (representing Queen Elizabeth II, head of state), prime minister (head of government), cabinet. Legislative — bicameral parliament. Judicial — district courts, Eastern Caribbean Supreme Court (High Court and Court of Appeals), final appeal to Privy Council in London. 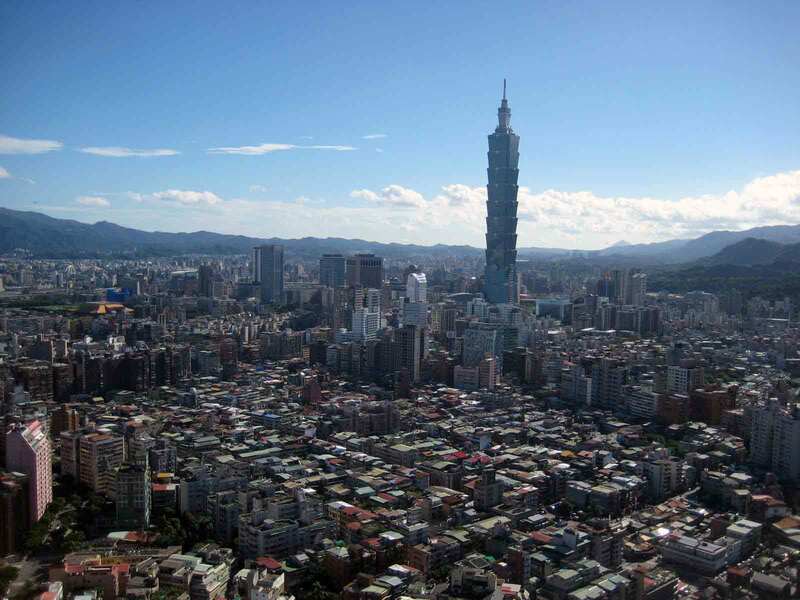 Trade (2005): Exports: $64 million (merchandise) and $389 million (commercial services). Major markets — European Union (28.2%), Trinidad and Tobago (22.5%), United States (14.0%), Barbados (10.1%), and Grenada (5.2%). Imports — $475 million (merchandise) and $159 million (commercial services). Major suppliers — United States (43.9%), Trinidad and Tobago (14.2%), European Union (14.2%), Japan (4.6%), and Barbados (3.0%). Europeans first landed on the island in either 1492 or 1502 during Spain's early exploration of the Caribbean. The Dutch, English, and French all tried to establish trading outposts on St. Lucia in the 17th century but faced opposition from the Caribs. Increasing self-governance has marked St. Lucia's 20th-century history. A 1924 constitution gave the island its first form of representative government, with a minority of elected members in the previously all-nominated legislative council. Universal adult suffrage was introduced in 1951, and elected members became a majority of the council. 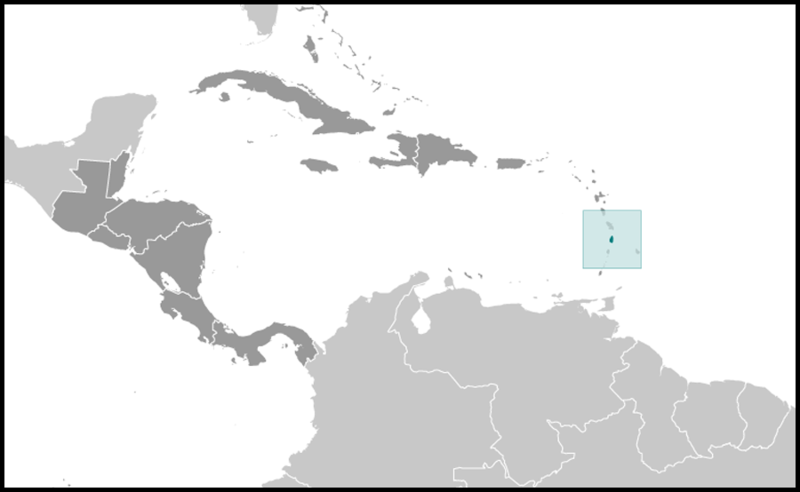 Ministerial government was introduced in 1956, and in 1958 St. Lucia joined the short-lived West Indies Federation, a semi-autonomous dependency of the United Kingdom. When the federation collapsed in 1962, following Jamaica's withdrawal, a smaller federation was briefly attempted. After the second failure, the United Kingdom and the six windward and leeward islands — Grenada, St. Vincent, Dominica, Antigua, St. Kitts-Nevis-Anguilla, and St. Lucia — developed a novel form of cooperation called associated statehood. The bicameral parliament consists of a 17-member House of Assembly whose members are elected by universal adult suffrage for 5-year terms and an 11-member senate appointed by the governor general. The parliament may be dissolved by the governor general at any point during its 5-year term, either at the request of the prime minister — in order to take the nation into early elections — or at the governor general's own discretion, if the house passes a vote of no-confidence in the government. The UWP was re-elected on April 16, 1987, but with only nine of 17 seats. Seeking to increase his slim margin, Prime Minister Compton suspended parliament and called new elections on April 30. This unprecedented snap election, however, gave Compton the same results as before — the UWP retained nine seats and the SLP eight. In April 1992, Prime Minister Compton's government again defeated the SLP. In this election, however, the government increased its majority in parliament to 11 seats. The United Workers Party won an upset victory in elections held December 11, 2006, taking 11 seats against 6 won by the St. Lucia Labour Party. Sir John Compton once again returned to the position of Prime Minister, as well as Minister of Finance. The United States and St. Lucia have a cooperative relationship. The United States supports the St. Lucian Government's efforts to expand its economic base and improve the lives of its citizens. The Government of St. Lucia has cooperated with the United States on security concerns. U.S. assistance is primarily channeled through multilateral agencies, such as the World Bank, and the Peace Corps USAID (http://www.usaid.gov/locations/latin_america_caribbean/country/car_regional/index.html) office in Bridgetown, Barbados. The (http://www.peacecorps.gov/), whose Eastern Caribbean regional headquarters is located in St. Lucia, has numerous volunteers located in St. Lucia, working primarily in business development, education, and health. U.S. security assistance programs provide limited training to the paramilitary Special Services Unit and the coast guard. In addition, St. Lucia receives U.S. counternarcotics assistance and benefits from U.S. military exercises and humanitarian civic action construction projects. The U.S. Embassy (http://barbados.usembassy.gov/) in Barbados is located in the Wildey Business Park, Wildey, St. Michael (tel: 246-436-4950; fax: 246-429-5246).